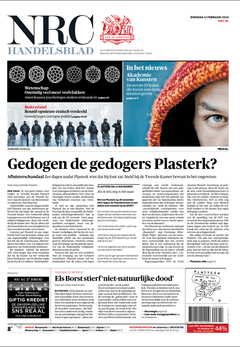 NRC Handelsblad (Dutch pronunciation: [ɛnɛrseː ˈɦɑndəlzblɑt]), often abbreviated to NRC, is a daily evening newspaper published in the Netherlands by NRC Media. While considered one of the Dutch national quality newspapers next to de Volkskrant and Trouw, NRC Handelsblad sees itself as the most internationally oriented of those three, and has been labeled left liberal. Journalists who work or have worked for NRC Handelsblad include: Henk Hofland, Hans van Mierlo, Marc Chavannes, Geert Mak, Karel van Wolferen, Jérôme Louis Heldring, Joris Luyendijk, Marjon van Royen, Derk Jan Eppink, Adriaan van Dis, Ben Knapen. ↑ Cordula Rooijendijk (2005). That City is Mine! : Urban Ideal Images in Public Debates and City Plans, Amsterdam & Rotterdam 1945-1995. Amsterdam University Press. p. 23. ISBN 978-90-5629-382-6. Retrieved 9 December 2014. ↑ Donker na conflict weg als hoofdredacteur NRC de Volkskrant. Archived April 29, 2010, at the Wayback Machine. ↑ "Circulation figures". HOI, Institute for Media Auditing. Retrieved 22 September 2014.